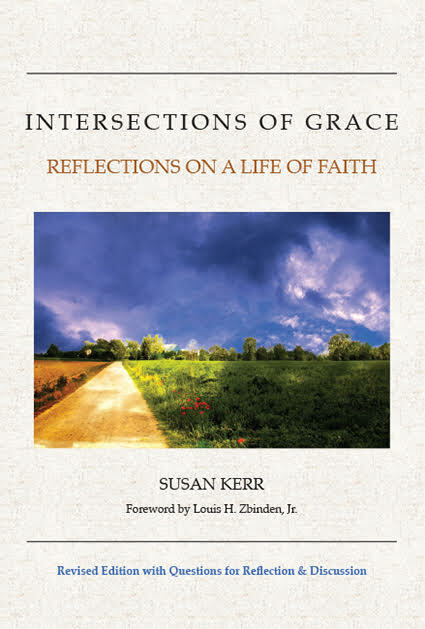 Intersections of Grace: Reflections on a Life of Faith grew out of a series of devotional talks Kerr delivered to her church community. After receiving encouragement from so many she turned the talks into a collection of essays and prayers. God’s Word, nature, pets, travel and daily life inspired the writings. What makes them unique is Kerr’s ability to take experiences and reflect on them in the light of her faith, and teasing out of the ordinary, profound lessons for all of us. If we are attentive, she writes, we can see the intersections of God’s grace at every step of our journey. This new edition contains reflection and discussion questions for each chapter that are an aid to guide a group or an individual into a deeper awareness of God. The reflections will encourage all to be alert alert to the intersections of grace in their own lives. This purchase is for a PDF download; please include your address and a printed copy of the book will be shipped to you upon availability. SKU: 978--1-947460-03-4. Category: Susan Kerr. This purchase is for a PDF download; please include your address and a printed copy of the book will be shipped to you upon availability. No refunds.